eople need their machines to be fast, reliable, light and highly productive.. that’s how we ended up with ultrabooks. In this video review Digital Magnet draws your attention to one of those high-end productive and fast machines. 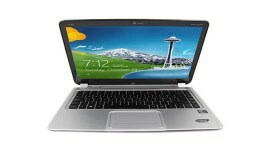 This is HP Envy Touchsmart 4. This machine has what to show both from the outside and hardware-wise as well. The metal case stands out with a nice brushed surface and smooth periphery lines. They are highlighted by a delicate silver bezel along the edges. The brushed aluminum silver surface inside achieves a nice and contrasting two-color play. Opening the machine we find a nice bright 14 inch touchscreen on the HP Envy Touchsmart 4. As you probably have already figured it is running the touch-friendly platform Windows 8. 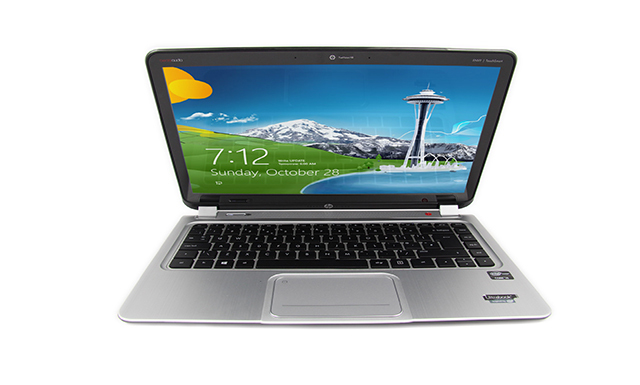 The machine is run by 3rd generation IntelCore i3 and i5 processors, respectively at 1.8 and 1.7GHz. The chipset performance is backed by up to 8GB of DDR3 system memory, however, the better news is that you can put up to 16GB of RAM inside. The graphics here are handled by the integrated Intel HD 4000. The hard drive storage of this machine offers 500GB but this ultrabook handles great amounts of work just perfectly thanks to 32GB solid state drive. If you have busy schedule you definitely cannot afford to be tied to the wall to get things done. The 4-cell Li-Ion battery unit here provides around 7 hours of independent work. Thus you can easily optimize your work schedule and complete your tasks while you travel. The stereo speakers are placed just between both hinges and they feature Beats Audio technology. Beats Audio here delivers a high-end sound that can easily replace common desktop speakers as the sound is loud and crystal clear. The controls include a nice island-style keyboard with black and soft keys, there is a touchpad centrally positioned below. It has a textured finish that additionally contributes to the accurate gesture commands. It executes the same gestures supported by the touchscreen. This HP ultrabook connects via 2 USB 3 ports, 1 USB 2 port, HDMI and an SD card reader. The 1 MP True Vision HD webcam captures images and video in 1280×720. This HP ultrabook weighs 4.5 pounds. An ultrabook that delivers a 3rd gen Intel performance, a touchscreen and Windows 8 at a moderate price.